What are 10 questions you should ask if you’re in a car accident? 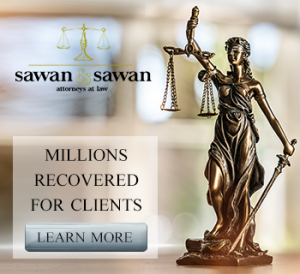 Sawan & Sawan has experience representing the victims of automobile negligence and we put together the following answers to several frequently asked questions for those in car accidents. If you have any specific questions about your potential automobile accident claim, call the Car Accident Lawyers at Sawan & Sawan today at 1-866-INJURY-0 to schedule a free consultation. Question #1: What do I do if I’m involved in a car accident? If you are involved in an automobile accident, you should under no condition leave the scene; otherwise, you could face criminal charges. The most critical first step is to call an ambulance if someone has been injured. Make sure your vehicle is not creating a hazard to other motorists by moving it from the flow of traffic, when possible. Next, you should call the police and file an accident report. Never admit liability at the scene of the accident–this is a legal matter that will be investigated later. Be certain to collect the names, addresses, and phone numbers of any witnesses, or others involved in the accident. It is also a good idea to take photographs to document skid marks, vehicle damage, road obstructions, and injuries. Remember, your phone, dash cams, and other modern technology can be your friend when gathering evidence. 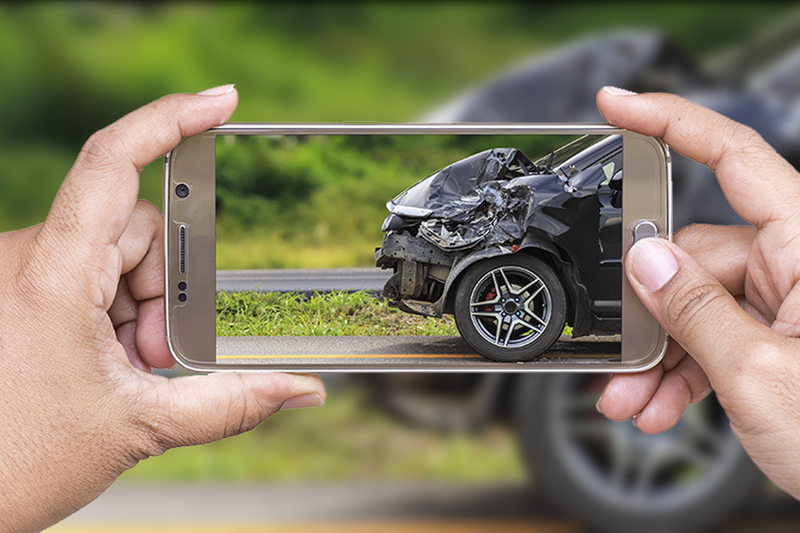 If it’s accessible, it’s always a good idea to use your phone to photograph the accident scene – including the orientation of cars, any skid marks and anything else that you believe is pertinent to your case. Make statements regarding liability or fault for the accident. Question #2: When the police arrive, should I discuss the accident with them? Yes, you should absolutely always cooperate with law enforcement. However, irrespective of whether you are the victim or the individual at fault for an automobile accident, it is important to limit yourself to discussing only the known facts. Remember – no matter your role in a car accident – always avoid speculation or statements of blame. Accusations have a time and a place, but the scene of the accident is not it. The legal process exists to determine the truth – but you must let it work by keeping speculation to a minimum until you are in a more controlled environment. If you have any specific questions about any automobile accident claim, call the Car Accident Lawyers at Sawan & Sawan today at 1-866-INJURY-0 to schedule a free consultation. Question #3: How much does it cost to speak to a car accident lawyer? One of the most frequent questions we get at Sawan & Sawan is about how much Car Accident lawyers cost. While this can vary to a degree based on location and firm, we are sensitive to the unique circumstances victims find themselves in. Often, victims of a car accident lose their ability to work or incur significant out of pocket expenses. Because of this, at Sawan & Sawan, we never charge for an initial consultation or for a review of the facts surrounding your case. Personal injury cases we handle generally involve a contingency fee agreement, although alternative payment methods are sometimes available if you prefer. Under a contingency fee arrangement, the client agrees to pay a specified percentage of the recovery. If there is no recovery, there is no fee and we often absorb the expenses which have been advanced on the case. Call 1–866-INJURY-0 today to schedule a free consultation. If you have any specific questions about any automobile accident claim, call the Car Accident Lawyers at Sawan & Sawan today at 1-866-INJURY-0 to schedule a free consultation. Question #4: How soon after a car accident should I get a lawyer? In short – Quickly. Time is of the essence in protecting your rights, especially in legal matters as one misstatement or misstep can have wide ranging and unforeseen consequences. To be safe, you should talk to an attorney as soon as possible, especially under circumstances where the injuries are severe or a death has resulted. It is far too common for evidence to disappear, memories to fade and for witnesses to move. This all can negatively impact the practical ability to prove your case. Also, if you are still being treated by a doctor, an attorney can also provide you with guidance concerning your heath care and help you deal with the financial fallout of medical bills. Legal advice is also indispensable when answering questions about the settlement value of a claim, your insurance policy’s terms, or potential bad faith on the part of your insurance company. If you have any specific questions about any automobile accident claim, call the Car Accident Lawyers at Sawan & Sawan today at 1-866-INJURY-0 to schedule a free consultation. Question #5: Should I notify my car insurance company of the accident? Yes. Even if the accident wasn’t your fault, it is critical to notify your car insurance company to protect your rights under your insurance policy. Under your policy, you have a contractual duty to cooperate with your own insurance company. Most insurance companies require their policyholders to promptly notify the company of every auto accident so that they can gather basic information. In fact, it’s important to note that failure to provide information to your insurance company in a timely manner can mean the loss of coverage for the accident. However, you should avoid making any statements about who was at fault in the accident and only relate the facts of the accident as they occurred. Avoid speculation or guessing. You should consult with a personal injury attorney before providing any other information other than the basics to an insurance company. Also, be aware that often insurance companies will request a “recorded statement”. It is unwise to undertake such a statement without the benefit of legal counsel and you should always consult with your attorney prior to making such a statement. Question #6: Should I notify the other driver’s insurance company of the accident? Unless you want to jeopardize your claim, it is advisable that you hire a personal injury attorney to handle this type of communication. Most people have no concept of how the other side can twist something you have said so that you are robbed of the compensation you deserve. You must always keep in mind each insurance company’s goals in the process. The other driver’s insurance company is incentivized to minimize their insured’s involvement, while placing as much blame on you as possible. As a result, you should never communicate with them unless you have the benefit of counsel who is duty bound to serve your interests, and your interests only. Question #7: Should I give any insurance company a recorded statement? The short answer is NO. While you have a duty to cooperate with YOUR insurance company and give them a statement, this does NOT require that you give a recorded statement to the other side’s insurance company. Keep in mind that insurance companies will go to great lengths to secure these statements because they know that they can misinterpret statements made to limit responsibility. In fact, you should never give a recorded statement until you have consulted with an experienced personal injury lawyer. Also remember that insurance company claims adjusters are professional negotiators with extensive experience and are well trained to ask questions in a manner designed to limit your claim. Insurance companies are trained to save the company money, and one tactic they use is to make liability questionable and attempt to establish that your medical claims are unfounded. Therefore, it’s critical to consult with counsel prior to engaging in these statements to make sure you are prepared and are treated fairly at each step in the process. Question #8: What can I do if the other driver doesn’t have insurance? Unfortunately, in many states, this occurs far too often. Statistics show that nearly one in three drivers in the United States is uninsured. If you are involved in an accident with an uninsured motorist, you may mistakenly think that you have no legal recourse. In “at fault” states, such as Ohio, we often buy insurance to protect other drivers in the event we cause an accident. Few drivers know, however, that there is insurance available to protect yourself if you are injured by someone that does not have enough or any insurance –called uninsured and underinsured coverage. If you have this coverage, you can seek compensation from you own insurance company, as part of your underinsured and uninsured motorist coverage. If you do not have this coverage, then your only recourse is often to sue the driver individually. Most people who don’t carry insurance do not have much in terms of assets, so it’s unlikely you’ll make a recovery if you must resort to suing an uninsured driver. However, each case is different –so it’s wise to seek legal counsel before deciding on a course of action. Question #9: Can I handle my car accident claim on my own, or do I need a car accident lawyer? Following a car accident, it is understandable for individuals to want to settle the matter quickly and move on with their lives as soon as possible. Car accidents are unexpected and they can drastically impact our ability to live our lives. As a result, some may be tempted to try to take care of all issues—including legal issues— as fast as possible without getting professional representation. It is crucial to understand the pitfalls of trying to handle your case on your own. If you have this coverage, you can seek compensation from your own insurance company, as part of your underinsured and uninsured motorist coverage. If you do not have this coverage, then your only recourse is often to sue the driver individually. Most people who don’t carry insurance do not have much in terms of assets, so it’s unlikely you’ll make a recovery if you must resort to suing an uninsured driver. However, each case is different –so it’s wise to seek legal counsel before deciding on a course of action. When you retain the services of your own car accident attorney, you can be more assured that you are not going to be taken advantage of by the other side and that you will argue for the most compensation possible for your accident. Your car accident lawyer should be experienced in serious car accidents and understand the need to request the very specific information to document and ensure your damages are accounted for. If the other side is not willing to compensate you for your injuries, the car accident attorney can help evaluate the lawsuit and take the case to court to advocate for your full and fair recovery. Sometimes just knowing that you are willing to go as far as necessary to ensure justice and that you have strong legal support often influences the trajectory of the resolution of your claim reasonably right from the start. Question #10: How do the Car Accident lawyers at Sawan & Sawan negotiate with insurance companies? This is the area where an experienced and competent automobile accident attorney really provides value. As with anything, it is incredibly difficult to negotiate when you do not know the value of something. The laws of damages are rather complex, and often times, insurance company attorneys and adjusters simply do not respect the legal opinion of non-lawyers.